White Dutch This lush, low growing clover grows in some of the worst soils. It covers an area quickly, crowds out grasses and helps prevent erosion. Great for covering areas that you have trouble mowing. White dutch clover flower heads are mostly white, sometimes lightly tinged with pink. It grows only 3 to 10 inches tall. 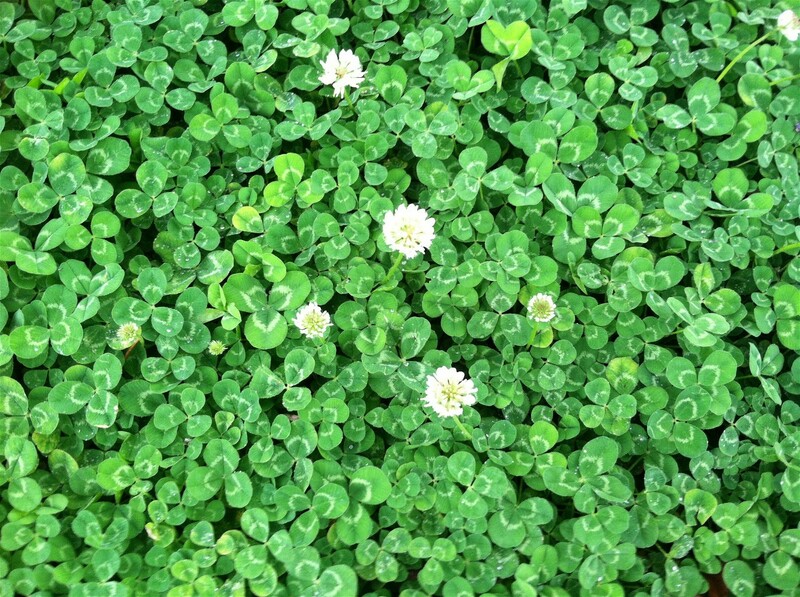 This clover is common in yards and lawns. White clover is a perennial. It produces above-ground, creeping stems that root at the nodes, thus permitting individual plants to spread over a considerable area. There is usually a V-shaped white mark in the middle of each leaflet. White clover is a perennial best adapted to well-drained silt, loam and clay soils that have a fairly constant supply of moisture. It can be grown on sandy soils with adequate moisture and fertility. It will tolerate slightly-acidic soils, but is not tolerant of saline or alkaline soils. Best growth will occur on soils with a pH ranging from 6.0 to 7.0 add lime if needed. It grows best during cool, moist seasons or in areas where irrigation is possible.